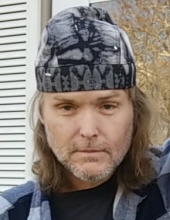 Paul C. Martinson, 46, of Bellevue passed away on Wednesday, January 16, 2019 at UnityPoint Health Methodist in Peoria. He was born September 1, 1972 in Peoria to Robert Martinson and Vera Wheeler. He is survived by his parents; children, Desina (Jacob) Luna, Hayze Martinson; siblings, Mike Clarkson, Bobby Martinson, Patrick Martinson, Amy Martinson, Brian Martinson and many nieces and nephews. His grandparents, Dorothy Kelly and Arthur Wheeler preceded him in death. Paul loved being a handyman, hard rock, a cold beer, working on cars and most of all he loved his kids. Cremation has been accorded and no services will be held. To send flowers or a remembrance gift to the family of Paul Martinson, please visit our Tribute Store. "Email Address" would like to share the life celebration of Paul Martinson. Click on the "link" to go to share a favorite memory or leave a condolence message for the family.